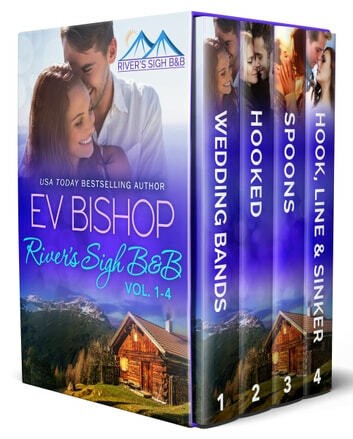 Together in one heartwarming box set for the very first time, this bargain book includes the first four novels in USA Today bestselling author Ev Bishop’s binge worthy small town contemporary romance series, River’s Sigh B & B. Cozy cabins, soul-soothing nature, outdoor adventures, and the healing, restorative power of love await you. “Book” your romantic getaway today! When Sam meets the daughter she gave up for adoption and starts to fall for the girl’s adoptive dad, every part of her screams, run. A romance between them would be too weird, wouldn’t it? There’s an extreme heat wave at River’s Sigh B & B, but things have never been colder between Noelle and her husband Cade. Can shattered love ever be restored? Four page-turning, full-length novels about overcoming heartbreak and finding your true home. Treat yourself today! Wedding Bands is a great story. Jo and Callum are almost too realistic. They had to learn to disregard the lies they were being fed. A couple of times I wanted to smack some sense into them, If they would just talk to each other! But when you are raised by a father like Callum's you have to understand his mindset. An interesting story of second chances and the start of the River's Sigh B & B. Hook, Line & Sinker is an awesome story! I could not put it down. I do not normally read stories about abused women but this one just pulled me in because Katelyn was such a fighter to get herself and her children to safety. (There are no gruesome details, she is fleeing when the story begins.) This book has vivid characters and a well thought out plot. I would like to visit River's Sigh for a long relaxing vacation. I highly recommend that you all the books set at River's Sigh. They should not be missed!